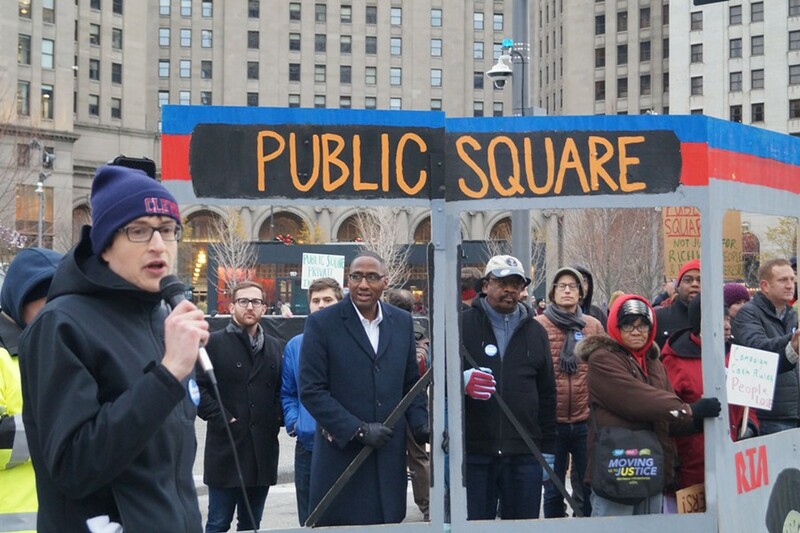 Clevelanders for Public Transit, the local coalition representing transit riders, has called once again for Public Square to be opened immediately. In light of a Jan. 12 letter from the Federal Transit Administration (FTA) granting RTA a 30-day extension on a $12-million debt, Clevelanders for Public Transit issued a press release reminding RTA of its only two options in the matter. "If the specific breach was unclear before, it is crystal clear today," the release stated. It went on to cite the FTA letter, which presented RTA with two acceptable outcomes. RTA may: 1) Reopen Public Square to bus traffic... thereby repairing the breach of a 2004 funding agreement, or 2) Reimburse FTA for the "loss of the federal investment." Though the FTA letter acknowledged "ongoing discussions," there was no mention of the city's and RTA's traffic study, which had been scheduled for completion on Jan. 18, one day before the original deadline (which was today). The deadline for repayment is now Feb. 21. RTA did not immediately respond to a question regarding the traffic study's status. But Clevelanders for Public Transit argued in its press release that the study almost certainly will not affect FTA's position, which it has communicated explicitly on multiple occasions since August. "The City of Cleveland is attempting to mitigate various impacts to bus service caused by the closure of Superior Avenue through an analysis of operational and financial impacts to GCRTA and is requiring GCRTA to create a safety mitigation plan before allowing bus service to resume on Superior Avenue. These address impacts of the closure of Superior and the City’s concerns, but fail to address the breach itself." This is correct. The breach is the closure of Superior Avenue through Public Square. Clevelanders for Public Transit has organized on behalf of riders, and the root of its opposition to the city's Public Square decision has always been a concern for them. Riders are often left out of discussions by city leaders, who reference "delays" and "operational impact" almost euphemistically, as factors somehow independent from the people who experience them. "Regardless of delays and operating costs," read the statement, "closing Superior also introduces an additional million turns per year and increases the distance that many connecting riders have to walk between stops and between rail and bus service. The City’s plan fails to address these negative impacts to transit riders." The group once again stated that Jackson's unilateral decision-making was out of order, in violation of an interagency agreement between RTA and the City. That claim, though Scene has brought it up to City Council, has yet to be meaningfully explored, even by those council members who have decried Jackson's maneuvers. Though the next step is framed by FTA as an RTA decision — RTA was the recipient of the Federal dollars — the ultimate decision on Public Square will be Mayor Frank Jackson's. It was Jackson who insisted on closing the Square and Jackson who insisted on keeping it closed. RTA has made it clear that it has no intention of paying the $12 million debt to FTA. Nor, the RTA legal team has written, is it legally obliged to. RTA board members (at least those not appointed by Jackson) are prepared to take injunctive action against the city. The City will be forced to pay the debt — the full amount or an agreed-upon settlement — if Jackson sticks to his guns. That payment will come at roughly the same time that Jackson is forcing a $2+ million Motocross track down the gullet of City Council (via some very suspicious maneuvering and the apparent cooperation of Council leadership). That project, despite good intentions, tends to be viewed negatively by residents and certainly by some city councilmen, including new Mayoral candidate Jeff Johnson. The Public Square debt. The motocross track. The publicly subsidized Q Transformation. All of these large, dubious expenditures were announced or mobilized in the immediate wake of the Cleveland income tax hike, which voters passed by a slim margin in November. It makes for ghastly public relations in an election year.